This summer season has been extremely busy for Christopher Holloway! Immediately following his triumph as Lord Ruthven in Scenic City Opera’s Der Vampyr, his travels took him to West Palm Beach where he joined the four person ensemble of Sweeney Todd in their three week run of highly acclaimed shows at Palm Beach Dramaworks which closed on August 6th. Read reviews here, here, and here. *Next, the baritone will join composer, William Dawson, Jr. , Steffanie Pearce, and Nadia Marshall performing world premiere music by the Fort Myers composer accompanied by Richard Bosworth, pianist, sponsored by Grand Piano Series in Naples, Florida on August 15th. Tickets and information found here. Press articles here and here, and a link to WFGCU public radio interview with both the poet, Peter Meinke and Bill can be found here (click the play button to hear the interview!). A Youtube link to Christopher’s lovely rendition of On Lake Norman is here. *October 21st finds the baritone reunited with The Qol Quartet in “A Night on Broadway with the Qol Quartet” at the Tarpon Springs Performing Arts Center. They will perform favorites from many genres of musical theatre in an evening of drama and comedy not to be missed! For tickets and information, click here. *On November 4th, the Tampa-area baritone will appear with many singers from his voice studio (Tampa Bay Voice Studio) in a one night only fund raising concert for Homes for our Troops. Read about this amazing charity to honor our troops in this fabulous concert here! Homes for our Troops main website can be found here. *December will see the baritone appearing in two Messiahs by Handel as the bass soloist. 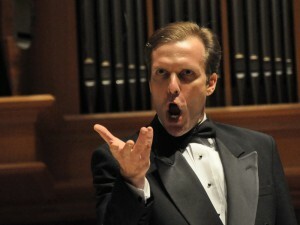 Christopher appears with the Sarasota Choral Society on December 9th at Church of the Palms, Sarasota. For tickets and information click here. Next, he will share a special Rifkin style performance with the Qol Quartet (Baroque style of singing where arias, duets, and choruses are sung by four soloists) on December 19th at St. Andrew’s Episcopal Church in Boca Grande. Information can be found here. *2018 is full of amazing performances for Chris including two important debuts, so check back regularly for updates! It’s an exciting time for Tampa-based professional opera singer, Christopher Holloway. This coming summer into the fall season finds the baritone appearing with Florida Lyric Opera as Maestro Strappaviscere in Viva la Mamma. This farce by Gaetano Donizetti will be performed in Italian with dialogue in English July 28th and 30th at 8:00 pm in The Space at 2106 Main Street in historic West Tampa. This is a run of performances not to be missed. September brings Christopher to perform a solo concert on the fine arts series of Berry College in Rome, Georgia on September 29th in the Ford Auditorium at 7:30pm with pianist Kris Carlisle. He will then give a masterclass for the voice area the following day. Christopher will be appearing throughout the state of Florida this summer and fall with the Qol Quartet home based out of Sarasota. The Qol Quartet was established three years ago, and Christopher joined the group last year. The all classically trained group consists of Johanna Fincher, soprano, Robyn Rocklein, mezzo-soprano, Adam Bielamovicz, tenor, and Mr. Holloway (bass/baritone). Their repertoire consists of classical and familiar operatic arias, duets, ensembles, as well as a cappella arrangements and musical theater solos and duets. For more information, send an email to qolquartet@gmail.com. Also, feel free to visit their website here. In addition, Christopher maintains a very active voice teaching studio out of his home in Trinity. His students perform nationally in a wide variety of musical styles including classical, music theatre, jazz, pop, contemporary christian, rock, and other alternative styles. This summer and fall will be very busy times for both Mr. Holloway and his students. For more information about Christopher’s private voice lesson studio, click here or send him a message here.